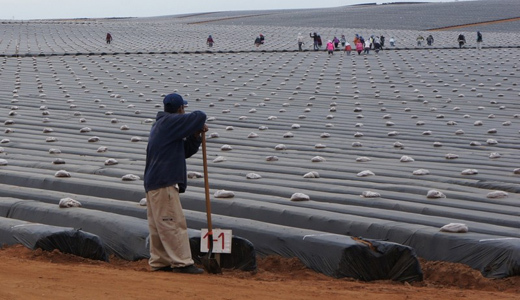 The United Farm Workers of America (UFW) in the United States has called for support for an epic struggle of mostly indigenous Mexican farm laborers in fruit farms in San Quintín in the Mexican state of Baja California Norte. The UFW is circulating a petition directed at Driscoll and stores which stock its products, which the union asks everybody to sign. Driscoll does not own the farms which are the focus of farmworker protests, but has such a large role in buying their products for distribution in the U.S. and beyond that it is in a position to pressure the growers to accede to the demands of the workers if it so desires. But Driscoll claims it is doing the best it can. The San Quintín conflict has its roots in the dynamics of NAFTA, the North American Free Trade Agreement. Readers may recall that when NAFTA was negotiated and signed, there was supposed to be a tradeoff for Mexican small farmers. It was recognized that opening up Mexico’s internal markets to a massive influx of U.S. and Canadian corn and wheat would have the effect of displacing millions of Mexican grain farmers and their families, who would not be able to compete with the imported grains – which in many cases are subsidized by U.S. taxpayers. However, the displaced grain farmers were supposed to be able to survive by getting jobs in foreign manufacturing concerns which were to flood into Mexico, attracted by the low wages. In addition, Mexican “specialty fruits and vegetables” were to have access to U.S. markets, providing another source of income for the former grain farmers. As for the prosperity to be gained by the increased access of Mexican “specialty” fruits and vegetables to U.S. markets, it has gone to wealthy landowners and growers and not to the displaced campesinos. Earlier this year, the Los Angeles Times published an eye-opening series on the conditions faced by Mexican migrant farm workers in these “specialty fruit and vegetable” production centers. The series, and many other reports, document substandard wages even by Mexican agriculture’s standards, ghastly housing conditions in the work camps, violations of Mexican labor law, denial of benefits required by law, physical abuse, child labor and sexual harassment. There is an ethnic and racist edge to this. About half of these migrant farmworkers in Mexico are indigenous people from southern states like Guerrero and Oaxaca. In the case of San Quintín, about 80 percent of the workers are indigenous people. Some do not speak Spanish but only Mixteco and other indigenous languages. They go to the poor and abusive conditions in the farm labor camps only because their ancient home communities are even poorer and getting poorer yet. These are the conditions that caused the outbreak of protests in San Quintín in mid March. Protesters left the fields, blocked a major highway, the Transpeninsular, and carried out militant demonstrations in which many were injured and arrested. Local authorities, siding with the growers, carried out raids on the homes of the protesters. 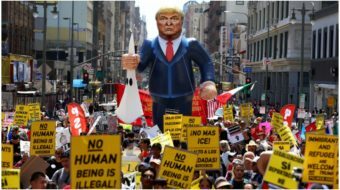 The protests are not being organized by Mexico’s officially recognized labor unions, which have strong ties to the Revolutionary Institutional Party that, under President Enrique Peña Nieto, runs the national government. The government of the state of Baja California Norte is controlled by the far right-wing PAN, or National Action Party, some of whose leading members are the selfsame growers against whom the farm workers are protesting. The organization representing the protesting farm workers is the Alliance of Farmworkers of San Quintín, which is supported by left-led independent unions and by the political left nationwide. The San Quintín workers aim to organize their own independent and democratic labor union. At the end of last week, it appeared that a settlement was in sight. 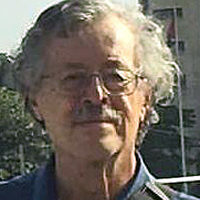 Negotiations carried out under the leadership of the governor of Baja California Norte, Francisco Vega de la Madrid (PAN), and including the presence – unwanted by the protesters – of three of the establishment labor federations, seemed to have hammered out an agreement. The terms include dropping the prosecution of arrested protesters, including the farm laborers in the benefits provided by the Mexican Social Security Institute, and a pay raise to 200 pesos per day (about $13 U.S.). All this was agreed to by the Mexican government. However at the end of the week, the growers, represented by the Agricultural Council of Baja California, announced that they had never agreed to that raise, and that they were sticking with a 15 percent raise offer. If the Mexican government wants the agricultural workers to be paid more, it should come up with the money itself, they added, claiming that the Mexican economy would collapse if such demands were acceded to. Workers currently earn between $6.50 and $10.00 a day. Correction: In a previous version of this story, it included a statement that the UFCW had called for a boycott but that was incorrect. It has called for pressure on Driscoll and launched an online petition. We regret the error.